Marrakesh is a busy city, probably one of the busiest in the entire country. It’s also one of the most popular among us tourists, and therefore one where street harassment is (unfortunately) at an all-time high. So yes, I understand your worries about appropriate clothing in Marrakech, and I’m here to help! 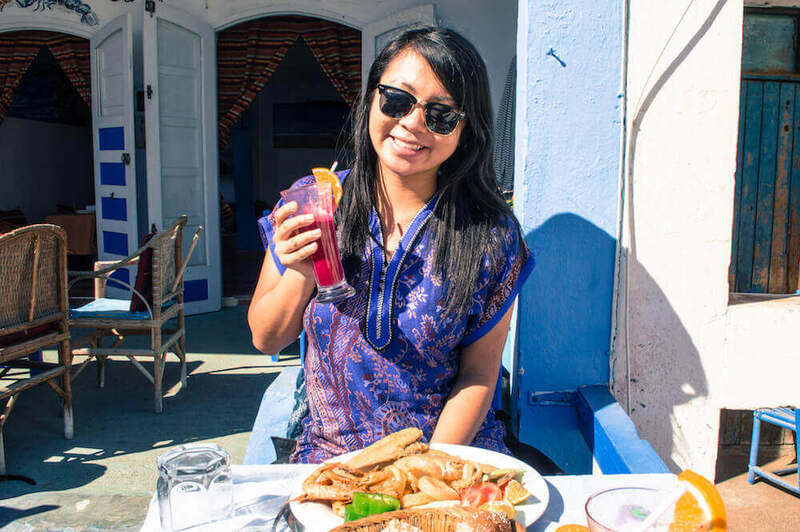 Now, before we get started, the first thing you should keep in mind is that Morocco is a big country, and depending on where you’re going and what time of year you go, what you end up packing will be drastically different. 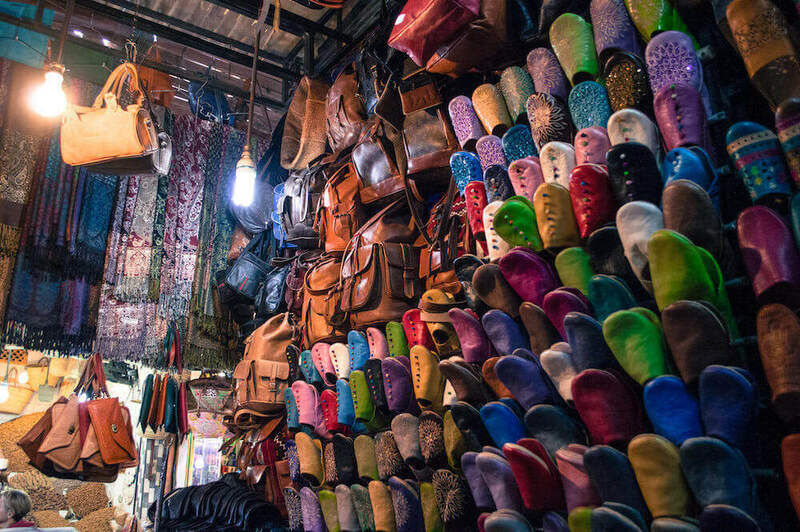 This guide deals specifically with what to wear in Marrakesh (a big city), but if you want more general Morocco packing tips, you can mosy over to this post right here. Anyways, without further ado, here is my full guide on how to dress in Marrakech, Morocco. 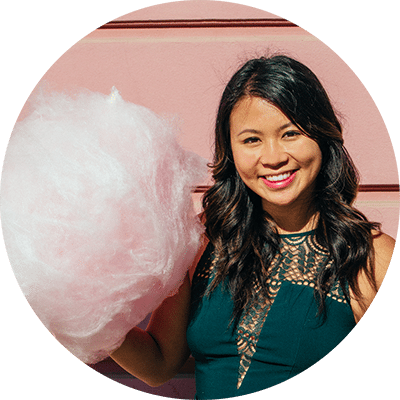 If you want a printable copy of my Marrakech packing list, click here to download it from my Resource Library! Okay, sorry – that was aggressive. 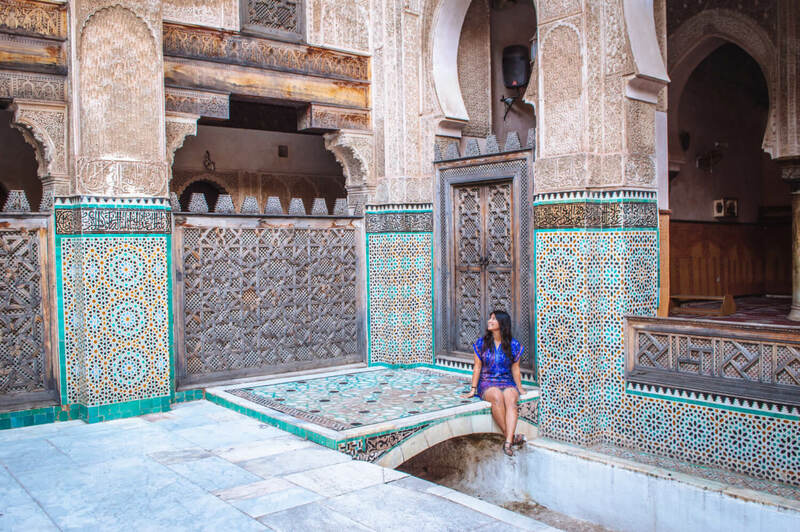 What I mean by this is, often people get blinded by the dreamy, photogenic side of Morocco that they see on Instagram, you know the twirly, flowy, dressy side of Morocco where all you do is subsist on pretty tile work and candid laughter all day. That, or they’re snapping away from the safety of their hotel, where street harassers are hidden far, far away. Now, I’m definitely not above glitzing up for the gram, so no judgment there, but just know that Instagram can paint an inaccurate picture of what is appropriate attire in Marrakech so don’t take allllll your outfit tips from IG only. Of course you can still bring your cutest outfits, but remember you’ll probably have to cover them with leggings or a sweater sometimes. I mean, duh, sorry – that’s SUPER obvious advice, but I needed to mention this because a lot of people seem to have this vision in their heads that Morocco is always sweltering hot. I’ve heard way too many stories of travellers arriving in Marrakech, even really well-travelled ones, and being caught off-guard by the cold, either freezing partially to death on their Sahara overnight trip or becoming human popsicles in their broken-heating hostel. So, know this: yes, Marrakech can actually get cold, especially during the winter months, so, be sure to check the weather for your trip and don’t just assume that it’ll be balmy hot all the time. Often people will ask if there’s a Marrakech dress code in place. The answer is no, not a formal one at least. In other words, don’t worry, there’s no actual law in place that condemns booty shorts or anything like that. BUT there’s a big difference between what you’re legally allowed to do and what you should do, for both respect and safety reasons. I mean, CAN you wear shorts in Marrakech? Yes, but should you? Unless you enjoy your long walks around town with a side of pervy male gaze, then I would personally avoid it. A good rule of thumb is to cover up your arms, legs and cleavage. This won’t stop the catcalling necessarily (it happens even when wearing a thick winter coat, trust me), but it’ll minimize the unwanted attention you do receive. If you’re in Marrakesh, odds are you might be moving onto other destinations in Morocco too. Remember that Morocco is a big country and the temperatures can vary quite a bit. So, don’t think that a packing list for Marrakech will be transferrable to all the other stops of your trip. Do your research accordingly! This of course depends on where you’re staying and how you intend to get around, but in my experience, especially around the “old town” (medina), the streets can be rough and bumpy, and generally speaking just not ideal for rolling a suitcase around. Riads will also often have stairs and no elevator, so it might be easiest to just bring a backpack vs. a rolling suitcase – less hassle that way. AND don’t pack it too full – you’ll certainly be doing some shopping while you’re there. Soooo… How should a woman dress in Marrakech? A LOT of people overcomplicate and panic-spiral unneceesarily about what to wear in Marrakech as a female traveler. Unless you cover up with additional layers or a scarf, these items will do you no good. Seriously. Marrakesh is not the place to flaunt your abs. Keep the tummy hidden for this one, ladies. As I mentioned before, wearing shorts in Marrakech isn’t illegal or anything – in fact, during the hot summer months, you’ll be seeing some local women wear shorts too, BUT you will get a looooot of unwanted attention if you show too much leg. One day in Marrakech, I wore a knee-length skirt and noticed so many more creepy stares than the day I wore jeans or leggings. If you hate getting stared at, leave the shorty shorts at home. As I mentioned above, legs = stares. I’d go for maxi dresses or bring some leggings to cover up. Unless you like limping… This is pretty obvious, but comfortable shoes are essential. I can’t think of any instance where you might need heels unless you plan to have a dinner someplace really fancy. My best tip for not getting pickpocketed is to not look robbable. There’s really no reason for you to bring your great great grandmother’s priceless brooch or your set of matching Louis Vuitton suitcases. The fact is, flaunting your riches here in Morocco will make you a walking target, not necessarily just for theft but for scams too. Anyways, if you want to minimize yourself as a target, don’t look rich. Last but not least, if you have a drone, don’t bring it. I’ve heard a lot of horror stories of them getting confiscated at airports, etc. Leave the drone at home! Excellent example of what NOT to wear…. Okay, #1 thing – don’t forget your sunglasses. Not only is that Moroccan sun no joke, I like them because they allow you to avoid eye contact. I know that sounds extreme, but the cat calling and general “luring” from shopkeepers can get overwhelming after a while, and having sunglasses on can really help you tune it all out. REPEAT AFTER ME: Scarves are the best. The reason I adore them with such maniacal insanity is because not only are scarves great for covering up, they’re also versatile and can add some fun/colour to any of your outfits. If you don’t pack any though, don’t worry, there are approximately 10.5 million stalls in the medina that will be happy to sell you one. These are great as an additional layer of warmth if you’re travelling during colder months, or just as a modesty thing to cover up if you want to bring skirts or dresses that are a shorter length. And while long skirts and dresses are great for wearing around Marrakech, I would make sure you pack at least one pair of actual pants too in case you do anything physical (imagine doing a camel ride in a dress). My go-to would be some loose harem pants, which are breezy and comfortable. I prefer them to jeans because jeans can get really hot and stuffy PLUS if they’re more tight-fitting, you’ll be attracting some unwanted stares. When making your Marrakech packing list, it’s important that you have something that you can throw over top your outfit to cover up. Depending on the time of year for your visit, this will either be a warmer cardigan for when temperatures get chilly, OR it might just be something thin and flowy like a kimono cover-up if you want to keep your outfit light and breezy. Last but not least, while there’s this common assumption that Marrakech is always warm and balmy, temperatures do dip when it gets dark, and it’s always good to have something warmer to layer on just in case. I hate to sound like a typical mom here, but pleaaaase bring a jacket! Okay, now that we’ve gone through dressing for Marrakech, let’s move onto some other things that you should be bringing in your bag. While you could always buy bottles of water to ensure you’re getting clean water in Morocco, getting a Lifestraw is way better for the environment and allows you to drink any water safely. You can grab one for cheap here! Little luggage locks are handy for making sure your belongings stay safe. I always travel with a pack of small ones – one scattered in each bag so that I always have one just in case, plus they’re super cheap so why not? If you don’t have any, you can grab some here for really cheap. PSA: I’ve found that some of the public restrooms in Marrakech don’t have toilet paper readily available, so definitely bring some with you just in case. Okay, to simplify things, if you’re still stuck on what clothes to wear in Marrakech, I’m giving you my easy Marrakech packing list that can be used and adapted for any length trip. Basically this is what I would bring on a four day trip to Marrakech (and it’s pretty much what I DID bring during my four day trip). If you are going for longer, simply mix and match to create different outfits or put some stuff in the laundry. My post on packing light will help you make the most out of your items and pack less! So I’ll leave you with a final note on what to wear in Marrakech during the winter-time. As I mentioned in the intro, a lot of people assume that Marrakech is ALWAYS warm. While their winters are definitely a lot less harsh in some other places, that doesn’t mean you can get away with thin dresses and sandals year-round. Both of my trips to Morocco have been in during the winter actually, and in Marrakech, while the temperatures were very comfortable, I would still need a thin jacket during the day and some additional layers at night. If you are going anywhere else besides Marrakech, look up the weather there. Temperatures can vary dramatically in Morocco. While Marrakech will be mild, heading up to the Atlas Mountains or going to the dessert will be much colder… even a day trip to Essaouira was quite chilly for me with the winds! Heating is unreliable in a lot of riads. There isn’t really central heating so make sure you bring warm pyjamas as well. The hostel I stayed at in Marrakech once upon a time had heating troubles and no hot water so I’m sure you can imagine how horrible that was. Pack for layering, not for absolute warmth. While Marrakech can get chilly in the winter, this totally depends day to day. One day it was super hot and I was sweating in my jeans, another day it was quite chilly and I needed to layer on an additional cardigan. This is why I would advise against bringing really warm clothes like big sweaters, etc. Instead, bring many layerable items which is more versatile. 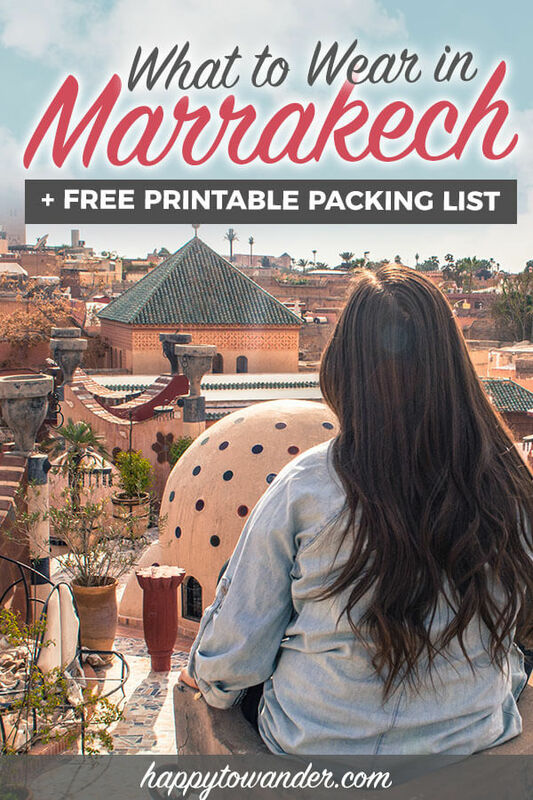 Grab Your Free Printable Marrakech Packing List! If you need a handy version of this printed out, I’ve got you. Click here to download it from my Resource Library! Any more questions about how to dress in Marrakech? I hope you enjoyed this guide on what to pack for Marrakech! If you have any further pieces of wisdom or Marrakech clothing advice you’d like to share, feel free to chime in the comments. 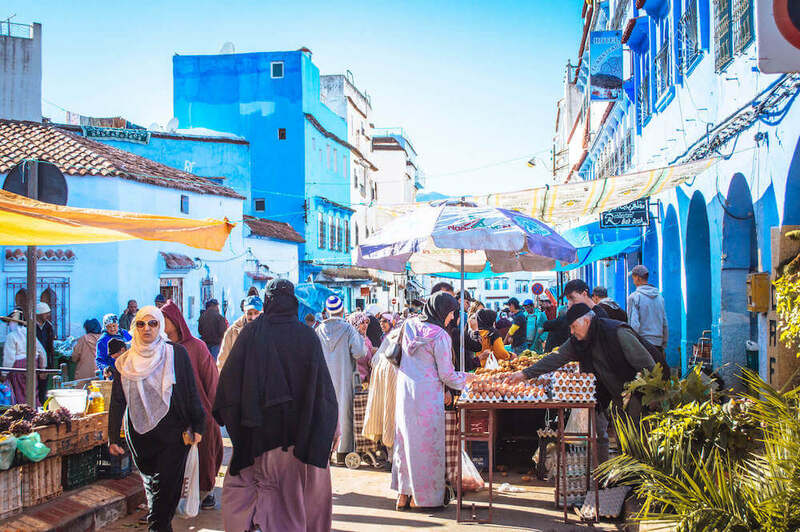 Next Article14 Crucial Morocco Safety Tips + Common Scams: Is Morocco Safe For Tourists To Visit?